'La Confessione 2012' is a theaterical piece and concept originally created by Italian author and director Walter Manfrè in 1993. 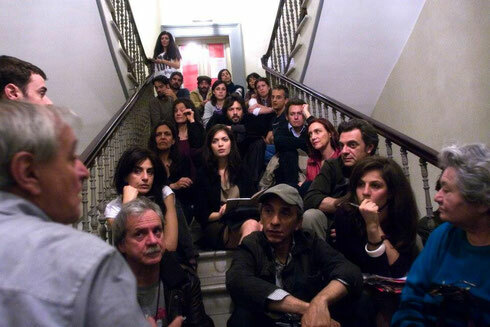 This very original and successful show worldwide played (10 actors and 10 actress which one after the other recite a personal 'confession', exctracts from Italian writers, to single persons of public, sat close to him / her on a church confessional), has been again on the stage of Teatro Valle Occupato of Rome, Italy, during May, 2012. The beautiful 17th century and one of the most big and old theatre in the center of Rome, is an unique story in almost all Italian and European panorama: occupied and in self-management from 2011 by young cinema and theatre workers, actors and actress against the danger of the closing, privatization and the national and local harsh financial Culture cuts, it shortly has became as one the most dynamic Art center of the Eternal City and of Italy, and now is a Foundation born by fundraising promoted by the same people living inside. Not the only 'Occupy' story in Italy, but the most famous in this field, Valle Theatre recalls the season of Sixties of Civil and Cutltural struggles, when Change came from the bottom. In conjunction with the show, my installation 'La Confessione 2012' project has been exhibited in the foyer of the Valle. A collaboration project, initially offered to me by Walter Manfrè and actor Enoch Marrella, which gave me occasion to create this portraiture idea and then installation, in a photographic investigation crossing the actor's 'persona' (person) with the 'personaggio' (scene's character). 35 photographs of the actors and actress -among them, experienced Italian artists as Andrea Tidona, Gianni Pellegrino, Silvana Bosi, Carola Stagnaro together with talented young actors and actress from Teatro Valle Occupato and beyond- of the Walter Manfrè play, each portrait taken during the rehearsal of every actor / actress own personal monologue told to me, single printed and then grouped in the installation. So many talents and characters, stories and emotions in different faces, in the landmark cultural laboratory which is Teatro Valle Occupato today in Rome.